Reality frays around me as if every Universe’s molecule had begun to hate each other at the same time. Including mine. Maybe it is not hate. Maybe it’s just… fear. A structural hysteria that urges the reality to flee from itself. Little by little, atom by atom. Inescapable. I start to think that I should shoot myself on my temple. Before the bullet dissolves, before my mind dissolves. A quick and dirty death, in contrast to the agonic decomposition that the reality is suffering. Stay cool, we have not gone 100% crazy. The Goat has been playing Dead Synchronicity and his telepathic powers transmitted us the post-apocalyptic atmosphere of the game. If you don’t know the game, we encourage you to give it a chance. 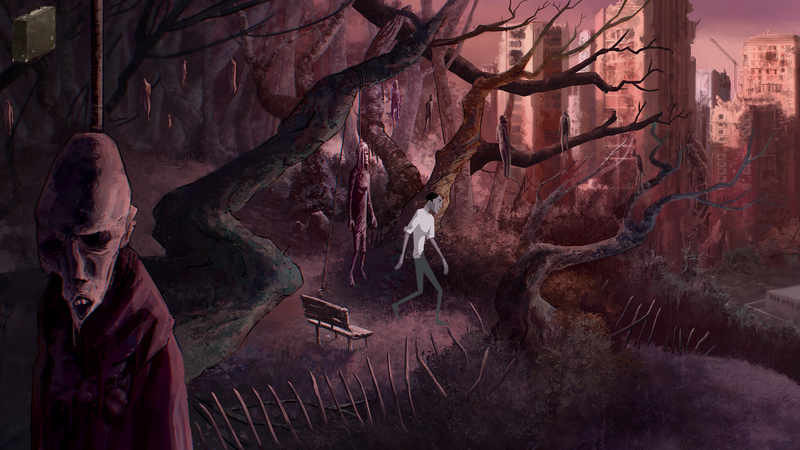 Dead Synchronicity is a dark science fiction point&click graphic adventure. A disaster, the Great Wave has devastated the civilization, leaving behind a myriad of perplexing effects. The Time itself seems to be about to stop and several survivors just dissolve into a pool of blood. This truly disturbing setting has been used to create adventure made with care. Right now, it is a Kickstarter and Greenlight project. You support them by pledging or voting (or both). In addition, you can download an Alpha version to try it out! That’s all for now. We will keep the hard work, don’t worry.